– Pack provides improvements to common sounds in the game, making them feel more immersive and real. – The goal of the mod is to make the game’s sounds feel like real life! – The mod is frequently updated to bring more real sounds into the game. * ETS2 1.30.1 + ATS 1.30.1. No errors in game log. Must have high priority in Mod Manager. * Compatible with all trucks, including truck mods. 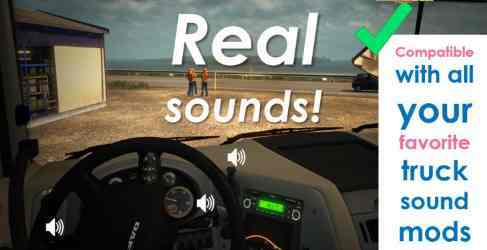 * Does not replace individual truck sounds, so can be used with an unlimited amount of truck sound mods of your choice. * Compatible with all maps. (provides realistic thunder + rain sounds). Both can be enabled at the same time. Check the load order image included for more details. than the Sound Fixes Pack for a more accurate seasonal experience. from Options folder of Sound Fixes Pack for winter sounds. – any AI traffic density/behavior mods (e.g. those listed in section below)! fast you are accelerating and what speed you are in, giving a feel for your sense of speed. * Heavier gravel sounds on dirt/gravel roads. * Light and medium impacts to suspension can trigger cabin squeaking and movement sounds of the cabin. * Hard impacts can trigger key swinging sounds in interior view. (volume of this sound depends on Music volume in the in-game Audio settings). * “Bing bong” chime for train and ferry loading screen sounds. * Reduced volume of garage door sound, adviser message sound and yawning sound. * New quiet photo camera sound effect for screenshots. * Quieter volume of PrePass weigh station signals in American Truck Simulator. * Improved UI sound effects. * Retro/historic ding sound for while the fuel is pumping (circa 1960s to 1970s). The number of dings can help give you an idea on how much you refueled. * Real fuel pump, fuel lid, door close, seat belt click and key insertion sound effects for after refueling to a full tank. light switch and blinker / indicator / turn signal. * Lane-keeping (Driver Alert Support) alert sound if you drive on to the grass too fast (as per EU legal regulations). * Lift axle sound now includes button press sound effect. * At high speeds, wind will sound slightly faster. * Mix of default amplified gear grinding sounds and new gear grinding sounds. Can be heard when you have damaged the transmission and/or gearbox. * Air cutoff sounds less audible in interior. * Real sound effects for trailer coupling + uncoupling. * Included air brake hose deattachment sound when uncoupling. * More refined generic AI traffic car sounds. Less buzz noise and more tire sounds and quiet engine sounds. * AI traffic vehicles given new horn sounds. Depending on the patience of the driver, a short or long honk may be used. (may include turbo sounds, distinctive engine sounds, sounds of gear changes, etc.). in various AI Traffic mods and in stock trucks from the original game. * You can hear the slight sound of vehicles overtaking you or passing by you in the oncoming lane. including biplanes, trains (included train horns) etc. jet fighters, ocean waves, tugboats, hot air balloons, you name it!). (includes both daytime and nighttime ambience such as cicadas and crickets). * Suitable volumes and sounds of environmental ambience for various map mods. * Some suitable sounds included for various companies and delivery points. * Improved sounds for animated gates mod. * Improved air horn sounds for American Truck Simulator available at the service station (replacing existing ones). Wind or tire noise too loud? No problem. You can configure its volume using these developer commands.